Today we had a triple Taluna ceremony With Gem, Petra, and Angel all being named as Wa Ngao Sisters. Both Gem and Angel finished their pledge periods and were elevated. In a long standing tradition of the tribe, the girl Bali was made a kajira of the Wa Ngao after successfully completing a trial collar period. The ceremony was well attended and Bali is a welcomed addition to the tribe. Felicity Coronet: This day, I have chosen Mchungaji to fulfill the task of bestowing the honor of the Wa Ngao Mark of Ownership upon this girl. First girl Jazz was honored with the Green Golden bracelet of Wa Ngao for her extraordinary services as Battlefield Healer. First Bow commended Jazz for her courage and skill in providing aid and asked En to present the bracelet in recognition. Jazz now wears the band and the title of Battlefield Healer along with the numerous other titles both formal and informal that she carries with such dignity and skill. [12:11] Felicity Coronet: She must either join with Us or depart. Recently mambas were spotted in Schendi. They were immediately investigated and accosted by members of Wa Ngao and Veck En. There is reason for this and mambas can become a real threat if they think they can freely make a home in the Schendi. It is wise to be on the lookout for further incursions. Today Jo became a Wa Ngao Kajira of the tribe. 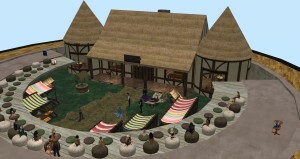 As you can see, the event was well attended. After practicing on her own, our Sister Donna was ready to try her hand at tharl racing this Wednesday at Wa Ngao Downs. Racing in Div 1 she did well and maintained 2nd place until the last tunnel when she got stuck, (it happens). We all still had a lot of fun and cheered her on! On Tuesday, November 8th, another Sister took the pledge to become a full Sister of the Wa Ngao. 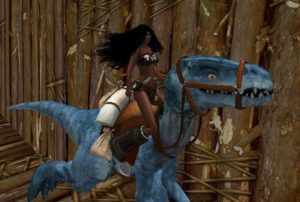 Join Us at the “Roadhouse” for this second event hosted by En’ Ecko Honi of the Toki Aka’am Taluna tribe and Her kajira cascade. Costumes are in order and the path from the landing point to the dance floor might be a little scary so be ready..
DJ Ame will be there to play tunes to keep Us hopping. 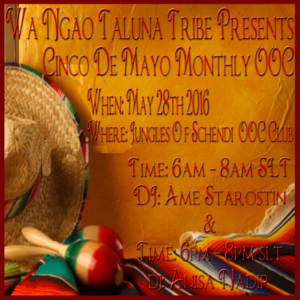 Cinco De Mayo OOC, May 28th! Another great build by En Echo and her girl Cascade. Our Sister Anise was DJ for the event. 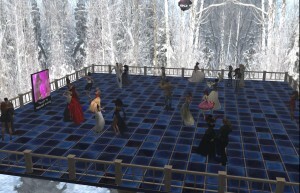 This event, besides being a fun get together for the continent was also a fundraiser for Relay For Life. 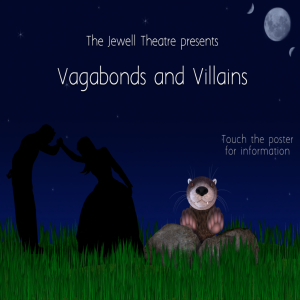 “Vagabonds and Villains” is a comic romp set in a mythical city of Pseudopolis. We meet a mixed band of characters as they go about their travels along a road known to be full of vagabonds, with the occasional villain thrown in for good measure. We all know trips outside a city’s walls can be fraught with danger! “Vagabonds and Villains” is inspired by “Pettrucchio”, a play referenced in the novel “Players of Gor” by John Norman. What would a Saturday evening be without some form of entertainment and enjoyment. And with Valentines Day just hours away, a perfect opportunity to get “in the mood”. Ok it’s that time again! But this time, we going to see the angels in the sky. as we dances on the “Stairway to Heaven”. The party will be a semi-formal ball and we ask everyone to wear semi-formal or formal attire if you can. Not must though. We do ask for this dance that all naughty parts be tastefully covered. Live DJ Sister Anise! Dancing in the graveyard with the ghosts and zombies. It was great fun and great music. Everyone looked grand! 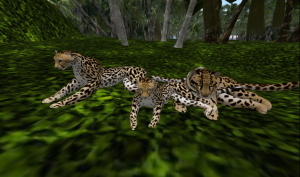 ecently the pride of cat-like gianis, jungle panthers, and larls has been see living in the jungle rain forests of the Schendi region. Sometimes aggressive, these creatures are often tempted to approach for a bit of tarsk or bosk meat.